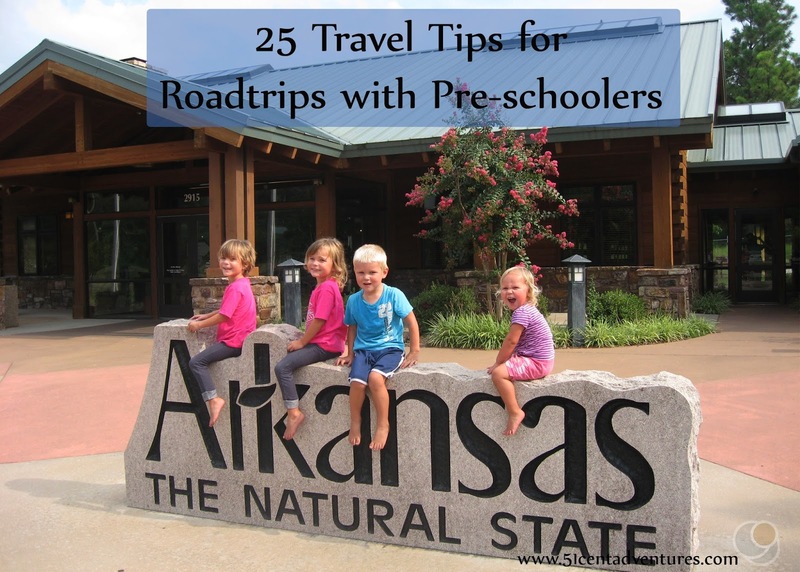 This summer I took my four pre-school age children on a road trip through 18 states. My husband was supposed to come with, but his training schedule made it so I had to go by myself. Thankfully, I had help most of the way. My kids and I traveled from Alabama to Texas by ourselves. Then we caravanned with my sister and her children to Utah. 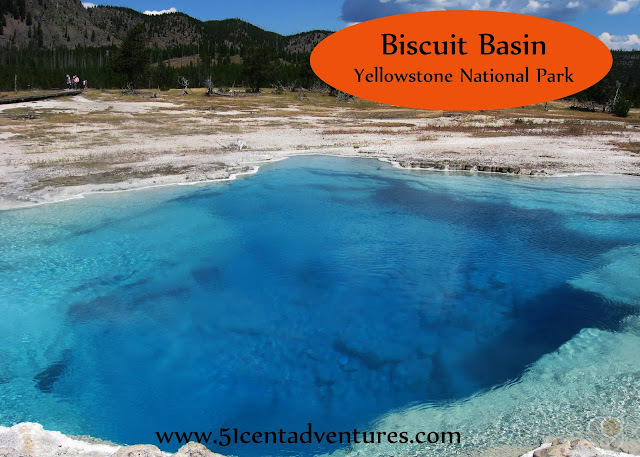 We were in Utah for my brother's wedding, but once that was over we went on a couple adventures including a trip to Yellowstone. Another one of my sisters came with to help out on that trip. We went back to Utah for a few more days, and then my sister, the kids, and I traveled all the way to North Carolina to visit another sister. (We are a very close-knit, albeit far flung family.) After a week in North Carolina we finally traveled back home to Alabama. We traveled about 7000 miles in 5 weeks. Days with over 12 hours of driving were common. We slept in hotel beds, guest beds, beds made on floors, and we even slept in a tent one night. We ate food out of a cooler on more occasions than I can count. Through it all my kids were great travel companions. Sure we had our difficult moments, but overall it was great. During the trip I learned a lot of little tricks that helped things go smoothly. I thought I'd share them here to help out those of you who are also crazy enough to travel with pre-school aged kids. It's a lot like childbirth. It's messy and uncomfortable, you end up screaming more than you planned, you are exhausted before it's over, you say and do things you never imagined, it's probably the very worst when it's almost over, and if you ever choose to do it again it won't be for a long time. But it's all worth it because the feelings of accomplishment and empowerment are amazing. Also you tend to forget all the bad parts and start thinking about doing it all again. 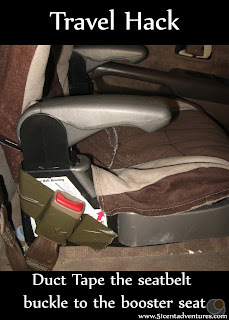 In previous posts I've shared a lot of tips for travelling with babies and toddlers. (See the end of this post for links.) Some of those things still apply to travelling with pre-schoolers. But some of them don't. Overall travelling with pre-schoolers is so much easier than travelling with babies. For one it was super easy to pack for this trip because I didn't have to bring any bottles, binkies, baby food, high chairs, or strollers. I brought my daughter's pack-n-play, but she hardly used it so it won't come along on any future trips. I think the best part was that all my kids could walk every where on their own. That made my life so much easier. My husband was supposed to go on this road trip with me. But when his training schedule changed it turned out that he had to stay home the whole time. Luckily, I have some really great sisters who helped me out. One sister caravanned with me from Houston to Utah. It was nice to have her watch my kids while I ran into bathrooms at gas stations or checked into motels. On the way from Utah to North Carolina another sister rode in my car with me. It was great to have another pair of hands to help the kids get what they needed or to load new movies into the DVD player. This is something I've done on other long road trips as well. Last year my husband was in Korea for nine months. I went to Utah for 6 weeks while was away. My in-laws helped me drive to Utah and my parents helped me drive back to Texas. Earlier this year my mother in law helped me with the kids as we drove to our new home in Alabama. I've been very grateful for all the people who are willing to help me travel during the times that my husband is unavailable. In theory, you can get a lot of driving done late at night while the kids sleep. It's also nice to drive through major cities late at night because you don't have to worry about traffic. However, don't expect your kids to fall asleep in the car without a fight. They usually start getting upset when the sun goes down. I've driven a long way with lots of screaming kids after dark. 5. Drive early in the morning. Leaving early is also a good way to get a lot of driving in while the kids sleep. Twice on my most recent trip I got up at 3:30 to put sleeping kids into the car so we could be on the road before 5:00. My kids would wake up a little bit, but they usually fell back asleep for at least an hour or two. The only downside to this method is that your kids are well rested while you are exhausted. It can be really hard to show up to your destination and have kids full of energy when you just want to sleep. So use this method if you have someone around who can entertain the kids while you catch up on sleep. Of course you'll have lots of extra clothes with you on a roadtrip, but you'll want some clothes to be readily accessible. I usually pack a zip lock back full of extra clothes for my kids, and keep it in my backpack/diaper bag. It comes in handy when they spill water all over themselves or get dirty somehow. If you are looking for a post with ideas for how to entertain your children without electronics - well this isn't the post for you. While I totally think that there is a time and a place for riding in the car without electronic entertainment - a 10 plus hour road trip with little kids is not one of them. Honestly if it wasn't for our built in DVD player I don't think we'd ever go anywhere more than an hour away. I especially like to show long movies like Chitty Chitty Bang Bang or the Lion the Witch and the Wardrobe because I can get in hours of driving without hearing any complaints from the kids. Whoever invented interactive DVD menus must have really hated parents. There is nothing worse than trying to cue up a movie for a child while wading through countless menu options like selecting a language, and wide screen format, and then waiting for cute little animations to play. It's even worse when you are driving. That's why I really appreciate DVDs that automatically play the movie right after the previews. Fast play DVDs and other DVDs that start up by themselves are also nice when the DVD remote has disappeared. At one point on the trip, my sister let me borrow her I-Pad and listen to a book recording. (Brandon's Sanderson's Firefight if you are interested.) This was great because the kids were able to watch Charlotte's Web for the billionth time, but I didn't have to listen to it. Instead I was able to listen to the book. The only drawback was that I felt like wasn't as focused on the road as I normally was, but that might have been because it was the third day of our trip to North Carolina. Rather than argue with my kids about getting into their seat belts quickly I provide an incentive for doing it. Even when we aren't travelling I give my kids fruit snacks after they are in their seats. When we are travelling I'll usually give them some of our travel snacks. This trick has saved me many headaches over the years. Buckling seat-belts is hard - it's even harder when there are other car seats in the way. One of the things we did to make it easier was to duct tape my daughter's seat-belt buckle to her booster seat. That way she (or let's be honest here - I) wouldn't have to fish around under her brother's car seat to try and find that stupid buckle every time. This is probably the last year I'll be able to get away with this, but even though my twins are completely potty trained I put them in pull ups on long road trips. I just don't want to deal with "Mom, I have to go to the bathroom." on top of everything else I have to worry about. Plus I can't imagine trying to get all four kids out of the car and running to the bathroom every time my girls need to pee. Nothing helps your kids accept the fact that you are still driving when it gets dark than glow sticks. You can usually find packs of them at the dollar store. I'll keep them in the glove compartment and get them out when it starts getting dark. I also like to buy different light toys at the dollar store. My kids love to take their shoes off in the car. So I usually don't even bother putting them into shoes until we arrive at our destination. I'll even factor in an additional 5 minutes to our travel time to account for putting on shoes once we get there. While we are travelling I keep all the shoes in a bag that is attached to the passenger seat. Once we arrive I'll pull the shoes out and help my kids put them on. 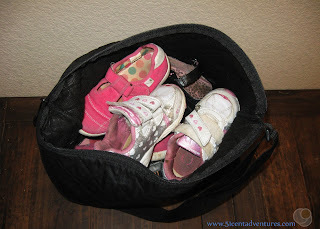 When we are done with our adventures I make sure the kids take off their shoes and put them back in the bag. That way we don't have to try and find the shoes next time we need to get out of the car. I especially like this system when the shoes are wet. It's nice to have a place to put their shoes instead of letting the wet and dirty shoes get all over the car. Our shoe bag. I like that it has a zipper so it closes easily. Generally you should plan to drive for three hours and then stop for one. It wont always work out that way - sometimes your kids will need a break after only 2 hours and sometimes you can stretch it to 4 or 5 hours without stopping (even longer if it's night time). But plan for an hour break about every three hours of driving time. Your kids will handle the drive a lot better if they get a chance to get out of the car and run around every so often. 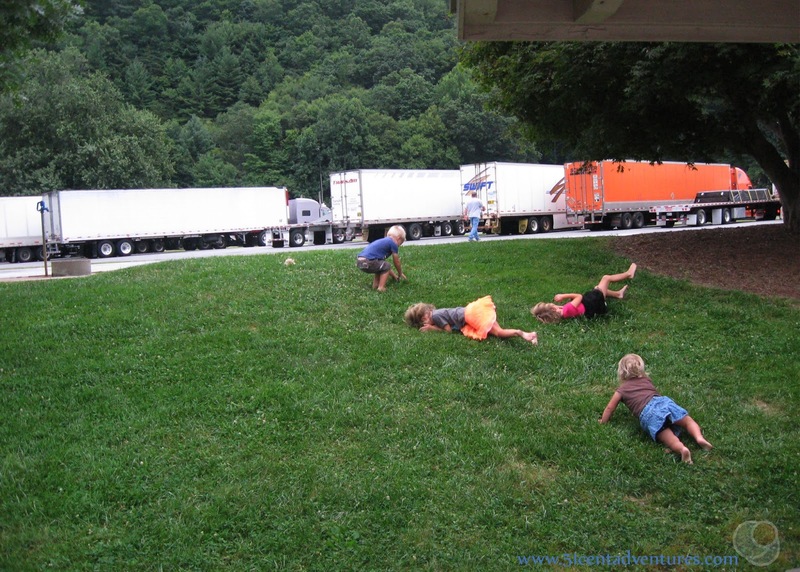 Rest stops are great places to let your kids run around. I was on my own for the part of the trip from Alabama to Houston. I didn't want to have to take all my kids into gas stations, and tempt them with candy on the way in. So instead, I made sure to stop and go to the bathroom at rest stops. There was one time when we had to go into a gas station and just as I expected my son tried to grab a container of Pringles as soon as we walked in. There have been a few times where I stop for gas first and think, "we'll find some where to run around after I get gas." Those times always end in disaster. Either the kids scream in the car while I pump the gas, or the older ones get out of their seat belts and refuse to get back in, We have seriously had picnics at gas stations because the kids needed out of the car so bad. So I've learned that its always best to find a place for the kids to run around and go there first. Then we can get gas after the kids get their wiggles out. Usually I'll stop at a rest stop and let the kids run around. Then we drive to the next exit and fill up on gas there. This is a good rule anyway, but it's even more important with kids. I always make sure to fill up the gas tank after we reach the half tank mark. This is good for your car because the fuel pump wont have to work as hard. It's also just a good safety tip in case you end up on a stretch of road where there aren't many gas stations. But it works really well with kids because they usually need a break from the car about every 3 hours which is generally how long it takes to reach half a tank. The only exception to the rule is if all your kids are asleep. Then you drive for as long as possible. I've found that on long road trips gas prices tend to even themselves out. Sure you might pay more at one gas station, but you'll find a better deal later to make up for it. It's not worth the time trying to locate the best deal. Even if you have an app that helps you find the best deal it's still not really worth it. Think about it, for every minute you are off of the freeway you are now one mile away from your final destination. So if you spend 15 minutes trying to find the cheapest gas in town then that's 15 miles (and precious minutes) you'll have to make up later in your trip. And kids generally aren't that fun later in the trip. If you're filling up at half tank you generally only have to buy about 10 gallons of gas at a time. So if you found the cheapest gas station by 10 cents you've only saved $1.00. Personally I'd rather save 10 minutes of total driving time over saving one dollar. For me the "best" gas station is usually the one on the same side of the road as my exit. That way I can exit the free way, access the gas station with a right turn, fill up on gas, and be on my way without all that mucking around with lots of left turns. It doesn't always happen that way, but I love it when it does. My parents love hotels and so when we traveled with them last year they paid the difference for us to stay in a nicer hotel than I was planning. At first I was like, "this is so nice, maybe we should start paying more for hotels." 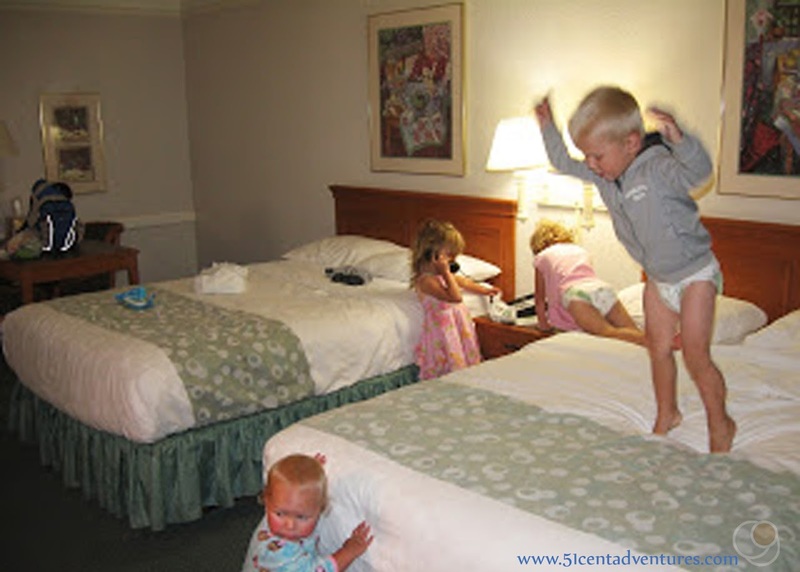 But then my kids started spilling things and I was like, "nope, I like staying in cheaper places because then I don't have to worry about my kids ruining the room." Plus I don't like paying a lot of money for a room that I'll spend maybe 12 hours in. I've found that after 14 hours of driving any room with a shower and a bed feels like a palace. There isn't any pitter-patters of little feet in my house, its all stomp stomp stomp all the time. When we get to a hotel my son loves to jump off the bed and land of the floor and stomp around the room. On this trip I finally started requesting a first floor room when I check into the hotel. That way we don't have to worry about disturbing the people below us. 22. Unplug the phone when you enter the room. My girls have always loved to play with hotel phones. So I've learned its just best to unplug the phone from the wall as soon as we enter the room. My girls even tell me now, "you forgot to unplug the phone." Most of the time we watch whatever is on TV at the hotel. The selection of shows is terrible, but usually there is something fun and nostalgic like "Full House" or a movie from my childhood on. Mostly it's a nice reminder of why we don't have cable. If my kids are having a hard time settling down I like to get out my laptop and turn on something on Netflix. My go to movie is the Many Adventures of Winnie the Pooh. This movie is perfect because its entertaining enough that all my kids watch it, but it doesn't get them all riled up. In fact, up until recently they always fell asleep during it. This is also my trick for getting the kids to be quiet when we are staying with people who need to get up early for work the next day. For health and financial reasons we don't eat out for every meal of our trip. Instead I bring a box and a cooler full of food. We snack in the car and have little picnics at rest stops. I'm even getting really good at planning dinners geared toward hotel microwaves. (I'll write a post about it eventually) But by the end of the trip we are usually running out of food. I always plan to go to McDonalds for dinner on the last day of driving. Fries and and ice cream do a lot to improve the kids' morale - especially when we still have a lot of night driving ahead of us. My kids like the idea of Happy Meals, but they never eat anything besides the fries and the occasional chicken nugget. The last time I bought a Happy Meal was last year. My daughter acted so excited that I'd bought her a hamburger and then she only ate one tiny bit of the bun. So I've given up on buying happy meals. This year I went to the dollar store and bought some little toys for each kid. Then I gave the toys to the kids after we were done at McDonalds. They were happy to have toys and I was happy to save money. Over the years I've had a slogan for various things. I start saying it while my husband and I planned our wedding, and now it applies to the adventures we take our kids on. Here it is: "If you're not having fun you're missing the point." So the biggest thing I want you to think about when you are planning a trip for pre-schoolers, is whether or not you and your children are going to have fun. Sometimes the road trip itself isn't the fun thing - sometimes its the thing you have to go through to get to the fun thing, but you still should be thinking about fun. The more fun your pre-schoolers and other kids have on your trip, the more likely they will be to want to go with you on more trips as they get older. And that's what a good road trip is really all about - spending time together as a family and making great memories. Love the duct tape tip! And the shoe bag thing!